Every 18 months or so, Rab Terry and Jennifer Fariss, the owners of the Studio Gallery in San Francisco kindly offer me a forum to exhibit work that I've compiled. As I work full time, it takes me awhile to accumulate enough pieces that are 'gallery worthy'. 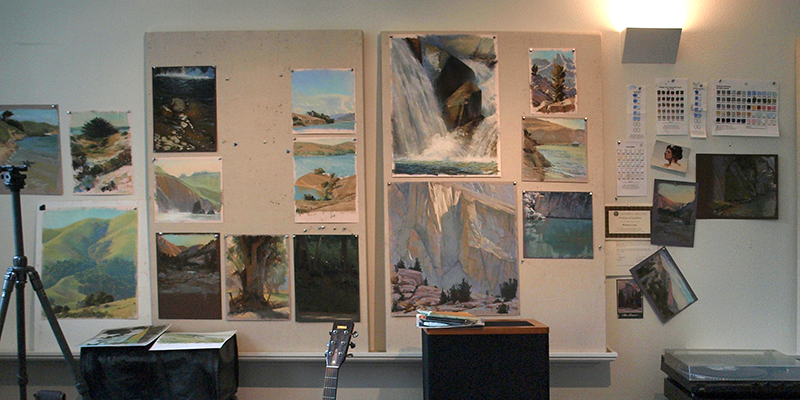 I primarily work plein air, but the impetus of a show like this encourages me to generate some studio pieces as well. This show is a good representation of my regular painting 'haunts': the routes I take to and from work in the east bay, some coastal pieces from my Pt. Reyes workshops, and work from my annual Sierra painting pack trip, plus the summer workshop I teach up at the Sierra Buttes. The show went up a few days ago, and this afternoon is the reception. I'll be heading over soon. I'll also be giving a talk at the gallery, this Thursday, the 18th of June from 7-8. 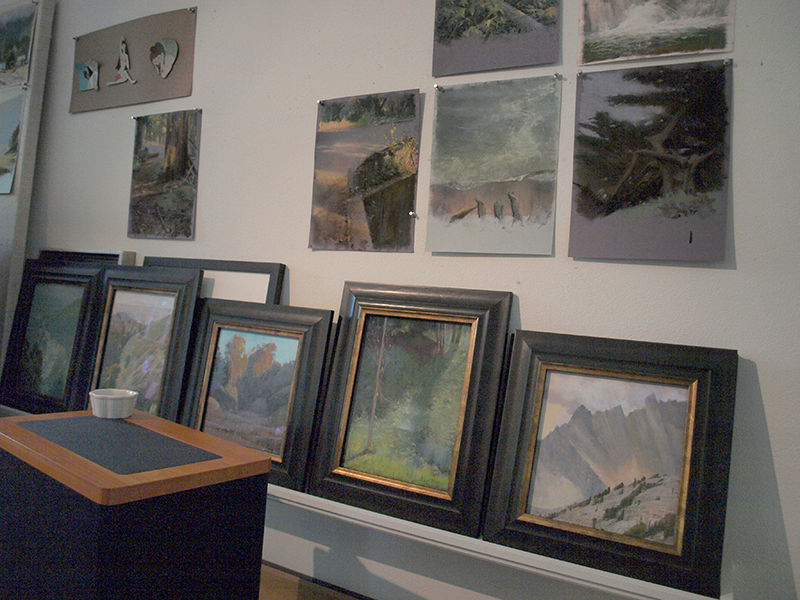 Part of the studio wall where candidate pieces for the show wait before being selected, signed and trimmed. Some framed pieces line the crit rail, and a few other 'hopefuls' are pinned above. The nerve wracking part of this process, after cleaning up all my edges, signing and photographing them, is to trim each piece within about 1/8th of an inch of its border, to fit it to the acid free foam core backing it will be hinge mounted to. This was painted on site at the Marconi Conference Center during the CAC winter retreat. It benefitted from hanging all spring in the studio, where I had time to ponder how to clean up and organize the sky a little more. I've been studying skies and clouds at work as an ongoing project, so used some of my thinking from that exercise to explore temperature shifts as a way to separate very close values between the cloud and the sky. Painted up at the Sierra Buttes last summer, during my workshop. 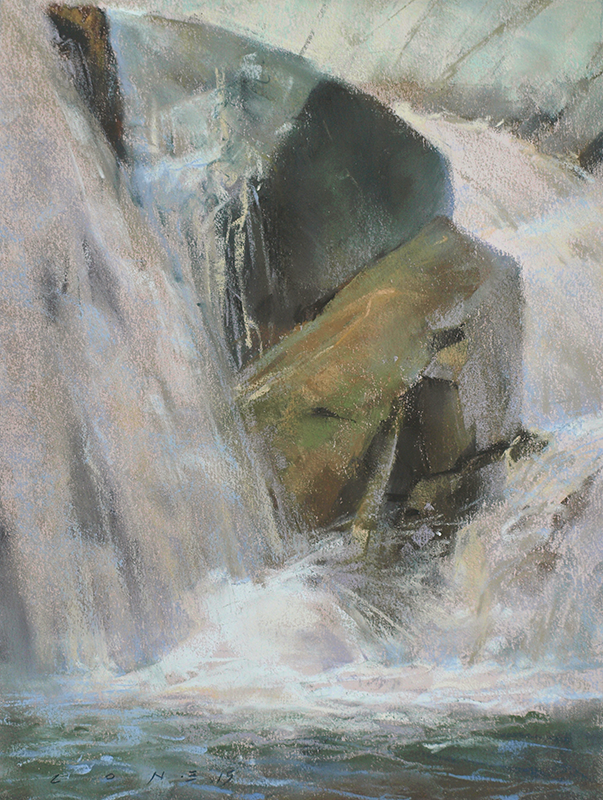 This is Love's Falls on the north fork of the Yuba River, which I've painted aspects of many times. I tried doing a large studio version of this, but it did not have vitality of the original plein air piece, so this one is in the show, and the studio version did not make the cut. Here's a studio piece that did make it. Last summer's pack trip was up into the Sabrina Basin, to Drunken Sailor Lake. We were camped on almost solid granite, and there were a few other lakes within walking distance, including Moonlight Lake, which had a beautiful emerald/turqouise color to the water from glacial silt. 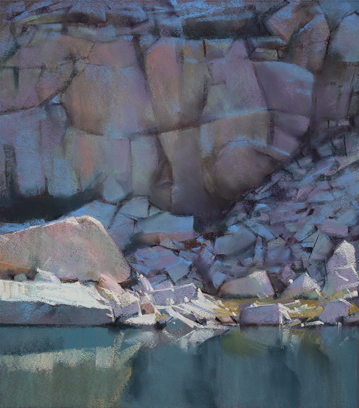 This type of subject is a favorite one of mine because it combines aspects of water, plus a celebration of reflected light in shadow, which on pale granite manifests itself in subtle temperature shifts that vary from the angles of the rock. That's it for now. I gotta run to the opening. Hope to see a few of you there. Wonderful! Your paintings make me feel like I am right there looking at that scene and feeling the warmth of the sunlight! Very Impressive, and wonderful to see your work. I hope all goes well. Keep it up! We all aspire to these heights, but you are making it!! Thank you both, Carolyn and Ida. Your comments are very much appreciated. I hope you are each getting time to paint in your lovely part of the world. The opening went well, by the way. 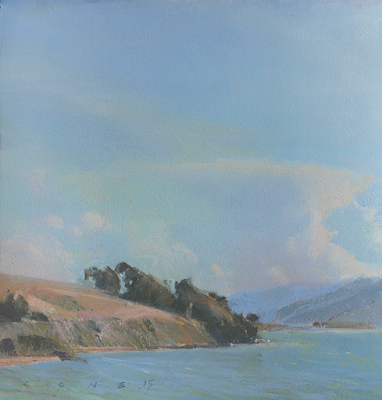 Do you have any framers to recommend in San Francisco, or advice for framing pastel work? 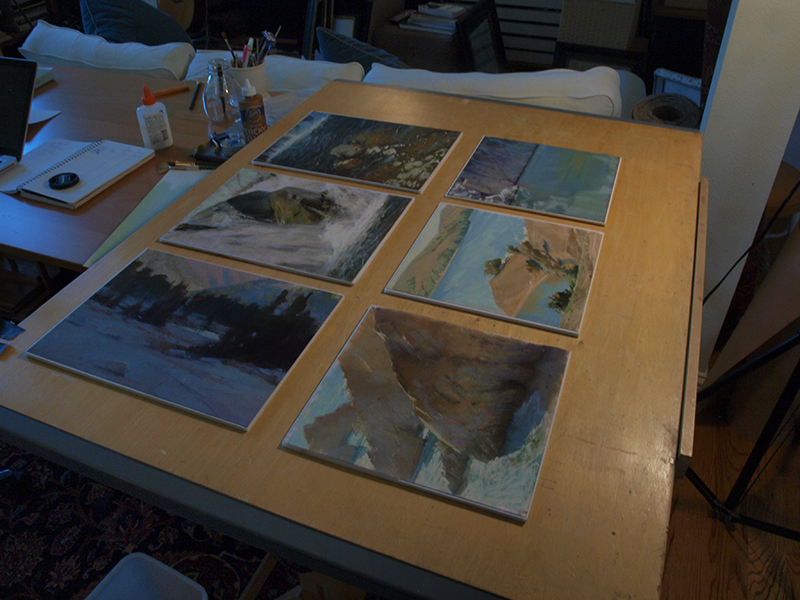 I stopped by two places recently and they seemed a bit reluctant to deal with unfixed pastel paintings like mine. Thanks in advance! I'd been following this blog for a while, but meeting a coworker of yours at a workshop the other weekend reminded me how beautiful your work was! Hi Janice, Thanks for the comment and the question. I don't know any framers in the city. In the east bay, I've used the Framer's workshop and Tim Holton's Framing studio. For framing a large body of work for my shows in the last few years, I've ordered frames from Randy Higbee down in Southern California. Any professional framer should be able to deal with an un-fixed pastel, but there are a few things you might want to do to make it easier for them. First, make sure you supply the artwork in a manner that is safe from accidental destruction. Make sure it is covered with glassine, and taped to a sturdy board, for example. Also, if you are framing it like a painting, without a matte, you may have to trim the image very close to the visible image area to fit into the rabbet of the frame. That is something that you might prefer to do yourself. It really depends. It is simpler in some ways to frame pastels with a matte, as you don't have trim the work so accurately, and odd-sized work can be matted to fit into a standard frame size.